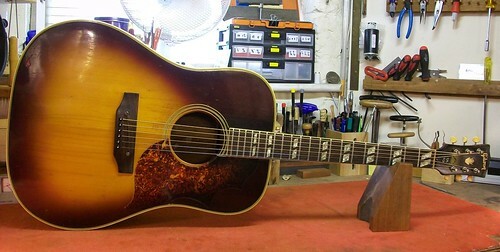 The owner of this lovely old Gibson SJ thinks it doesn’t have the sound projection that it should have. My suggestion is to fit a GPL Saddle Insert to replace the existing adjustable bridge saddle. 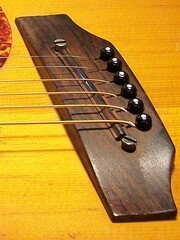 Adjustable bridge saddles of this type were used by Gibson and Epiphone on their acoustic guitars during the 1960s. 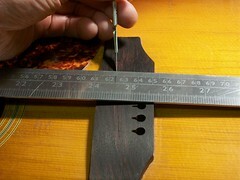 This adjustment gives the player the opportunity to set the action to the required height to suit the player’s style. However, when the saddle is set to a good playing action the saddle makes no contact with the soundboard; this is the down side to this system. This lack of contact is due to the saddle being suspended on two adjusting posts. These posts are screwed into two threaded inserts that are housed into the soundboard. 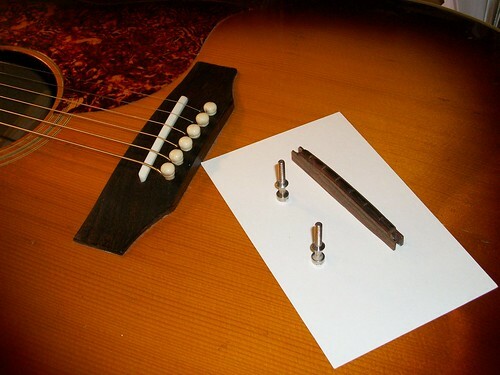 Therefore the transmission of sound vibration from the strings to the soundboard is via two metal adjusting posts. This is not an ideal situation for producing good volume or tone. 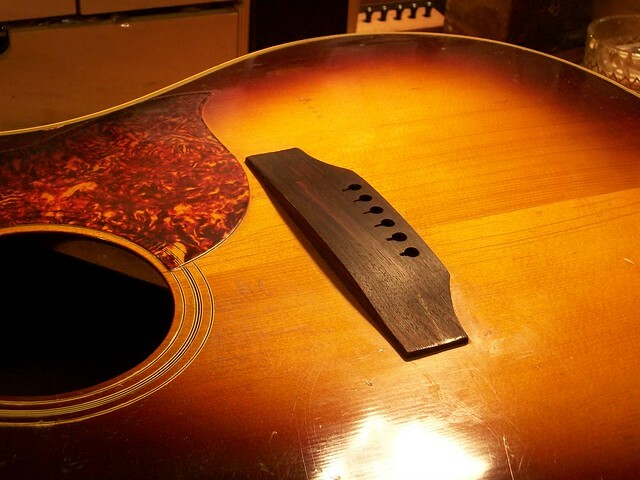 Simple logic would dictate that the more contact the saddle has with the bridge or soundboard the more transmission of sound, therefore producing more volume and more tone. What is a GPL Saddle Insert ? 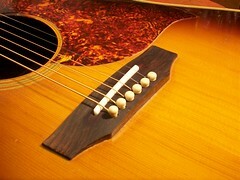 A GPL Saddle Insert replaces the existing adjustable bridge saddle found on vintage Gibson and Epiphone guitars. It’s a non-invasive modification and can be removed if necessary. It’s an idea that I’ve used on several vintage guitars in the past which has enhanced the volume and tone and brought out the true voice of the guitar. 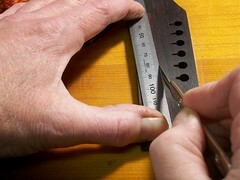 The GPL Saddle Insert is glued into place using high quality Hide glue. The remarkable thing about Hide glue is that it’s reversible. With most synthetic glues when it’s stuck it stays stuck. 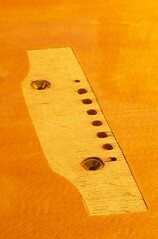 Not the case with Hide glue because it’s an organic material that softens with heat and moisture. 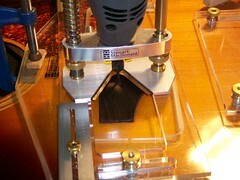 Therefore, by using a little heat and moisture the insert can be released and removed. Consequently, if the old saddle system needs to be put back into place it’s a simple job to reverse the above process and re-install the adjustable bridge saddle. Meanwhile the debate still rages on about the rights and wrongs of upgrading any aspects of a “vintage” guitar. 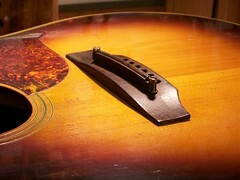 Many owners of instruments that are of a certain age are reluctant to change any element of that instrument because it would no longer be origin. In a nutshell, if you have a guitar that’s 30 plus years old, making upgrades or changes to it could make it worth less than if it remained unchanged. The GPL Saddle Insert cuts across this issue because it is a non-invasive change that can be removed when required. If you have an old vintage acoustic that’s not living up to its potential contact this workshop and ask about the GPL Saddle Insert. …………………………… it doesn’t show a lot of play wear and this might have been because it didn’t respond well and as a result, it never got the play for it to break-in and open-up since there was no vibration getting to the soundboard. Now that the vibration is connected to the soundboard for the first time in its life, it might open up and get much better than it has ever been; wishful thinking or rational reasoning? Even playing it last night warmed it up and as the evening wore on it seemed to sound better. I do have to say that it now does have a mystical kind of sound that is quite beguiling when one becomes familiar with it. As you can see, my enthusiasm has returned for the old SJ.